The answer is to start by mapping out the essential notes. We can look at technique and learn licks in future posts. But as a blues player, or any kind of player, the place to start is with the Country Scale. Let’s go.. Although aspects of both styles are rooted in European folk music, Country Harp is the product of a different musical journey to the Blues. It draws less on the Black American narrative and more on the musical traditions fostered by early White settlers. Consequently, it is sometimes redolent of folk music from Ireland, the British Isles, Scandinavia and North West Europe. Over time, the two disciplines have of course drawn from each other. Country and Piedmont Blues are recognised musical categories. There’s Zydeco, Western Swing and New Country – all of which share a strong blues infusion. You will find Cajun harp players and even Bluegrass embraces the humble diatonic lickin’ stick. Mike Stevens has been at it for years. Special country tunings do exist and some players alter standard reed tunings to make things more comfortable. 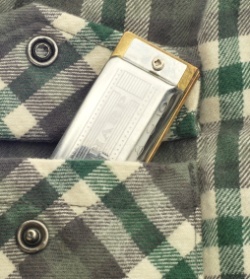 For now though, we’re using a regular Richter tuned 10 hole diatonic harmonica. We’re going to assemble the ingredients that give Country Music it’s classic flavour. 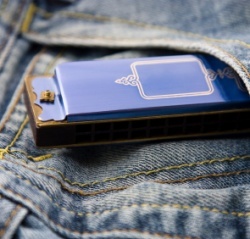 We’re in cross harp (second position) on an A harmonica – key of E major. First work at the lower and upper octave scales independently. Play them up and down and build fluency. Then run them together and mess around with them. Find your own sequences. You’ll quickly identify the principal safe notes and those with a country character. The full bend 3D” to 3D, and reverse, will become pivotal in the lower octave. For musical correctitude, here are the remaining safe notes that loop off the top end of the harp and onto the bottom end. Now, using the mid octave, let’s start to throw things around a bit and see what comes out.. 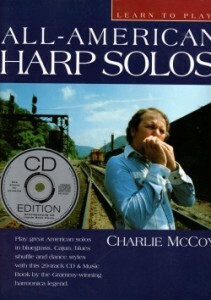 If you want the Good Doctor’s recommendation on a reliable reference book for Country Harping, then look no further than Charlie McCoy’s All-American Harp Solos (ISBN 0-7119-6680-x). Word has it the book is currently out of print, but if you search long enough you can still find copies. Be forewarned, it includes a healthy dollop of schmaltz. But the good bits are very good. Charlie paints from an eclectic palate; collectively his tunes provide a solid foundation of, and a great introduction to, country harp patterns. I’m a blues player but just came back from watching the ‘Doo Wah Riders’ here in Monrovia, CA, and came back desperately searching for some kind of ‘bluffers guide’ Sir, you’ve done the business, got me a bluffin’ within 5 minutes. Thanks much! Howdy Peter! Great that you found the first steps in Country Harp a useful introduction. If you want to take the next step, check out the Charlie McCoy stuff recommended. It’ll give you a really good grounding in the Country approach. And watch out for the secret ‘jaw swing’ technique for nailing faster sequences. Brendan Power adopted it for his Irish harping. Thanks Wilf. Not sure if I went to a workshop of yours once, it would’ve been a Sunday, in Brighton, maybe 2pm-ish, went there after a L2B bike ride. Johnny Marrs was the main ‘clinician’ bout 2004 ish I think. Looking out for the Charlie McCoy stuff. The best bluffers country harp is to draw in on 1-4 whilst saying “doh wah diddy, doh wah diddy, doh wah diddy” and blow a “doo” into 5. Then repeat the two “doh wah diddy”‘s but at the end instead of blow 5 do a 1 draw, 2 blow, 2 draw. Repeat this then you can continue with a run up 4d 5b 6b, 6d/6b 5b 4d – 5b 6b 5b 4d 4b 3d 3dbend 3d 3b. Opening and closing your cupping on the “doh wah diddy”s adds a nice touch. It works well. Try it and see. Yee hah. Another thing … I’ve been asked to gig with a bluegrass banjo band. Not my things at all as I like sloooooooow blues. Anyone got any tips on how to increase my speed whilst chugging and doing the train stuff? My train falls off the tracks when going about 5mph. How do I get that super fast chugging sound? Any tips? Hi Tony. Depends on the song, but cross harp affords you much more in terms of phrasing and style.